Stylish, roomy, easy to handle with a cruise speed of 130 knots, this 4-seat single-engine light helicopter is popular with both private pilots and charter companies. Featuring an enclosed tail fan, the Frogger is one of the quietest helicopters on the market today. Especially great for the man who needs to get to work fast but can't bear the moaning of neighbors complaining about noise and rotor wash.
A Frogger in Grand Theft Auto V.
The Maibatsu Frogger is a civilian helicopter in Grand Theft Auto V.
The design of the Frogger appears to be based primarily on the Eurocopter EC130 and the Eurocopter EC135, with larger windows. The Frogger is the only helicopter (barring all variants, like the Lifeguard helicopter) to have a ducted fan in place of a standard unshielded tail rotor. Unlike its real-life counterpart, the ducted fan on the Frogger does not have the slanted, unevenly-spaced blades found on the EC130's Fenestron. Blue Frogger piloted by Dom Beasley. The Frogger owned by Trevor Philips. The Frogger spawns in black with silver strips, maroon with silver strips, orange with silver strips, white with light brown strips, metallic blue with silver strips, and in the case of the Lifeguard variant, yellow. If purchased from Elitás Travel, the helicopter will always spawn in black with silver strips only. The Frogger has unremarkably average handling and performance. It has better, though not markedly, performance compared to the Maverick. The Lifeguard Frogger can be found flying around Del Perro Beach. 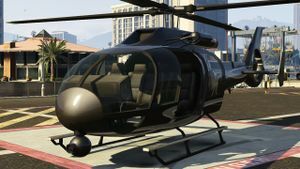 Hijacking the helicopter is hard, as it requires the player to damage the Lifeguard helicopter enough to cause the pilot to evacuate, and then push it to Vespucci Helipad. This helicopter has a unique fluorescent yellow paintjob. Trevor Philips - After the mission Three's Company, Trevor keeps the Frogger where it has been given a black paintjob with the "TP ENTERPRISES" name spray-painted on the tail. It spawns at the Sandy Shores Airfield. Commonly spawns at the Vespucci Helipad, with a pilot controlling it. The pilot will take off in the helicopter if the player gets too close before he gets out. Can be bought on elitastravel.com for $1,300,000. Used in some of the parachute jump locations-for example, the jump in Paleto Bay is serviced by a blue Frogger piloted by Dom Beasley. Although the ducted tail rotor is shielded, the player risks death by standing too close to it while it is still spinning. This is because the tail rotor is coded as an unshielded rotor. This page was last modified on 5 April 2014, at 14:38.